IndyCar driver Robert Wickens was hospitalized and is being treated for injuries to his lower extremities, right arm and spine after his car went soaring into the fence at Pocono Raceway in a scary wreck on the seventh lap Sunday afternoon. IndyCar said Wickens also suffered a pulmonary contusion. 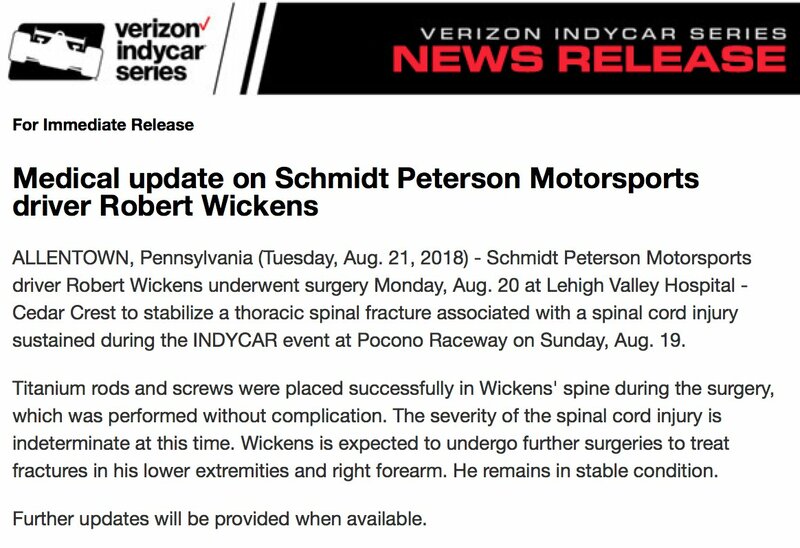 Wickens will have an MRI and will likely undergo surgery at Lehigh Valley Hospital-Cedar Crest in Allentown, Pennsylvania, according to the sanctioning body. The Canadian driver was attempting to pass Ryan Hunter-Reay when the two cars slightly touched. That caused Hunter-Reay's car to careen into the wall, and Wickens' car was pulled along for the ride. Once Wickens' car soared over Hunter-Reay's and hit the fence, it spun around like a top. The fencing was shredded, and Wickens' car was reduced to just the tub, which came to a rest on the track along an interior wall. Medical workers attended to Wickens, who was awake and alert, before transporting him to the hospital via helicopter. "That's the worst thing you can see. He's hurt. He's awake and alert, and at least he's alive," driver Sebastien Bourdais said. Only eight laps had been completed in the 500-mile race before the race was stopped. It was resumed after a delay of nearly two hours while workers repaired a section of fencing that was damaged by Wickens' car. James Hinchcliffe, Takuma Sato and Pietro Fittipaldi were also involved in the wreck. Hinchcliffe seemed to be in pain, grabbing his wrists as he slowly left his car. He was cleared from the medical center but declined to discuss the crash out of respect for Wickens, his teammate at Schmidt Peterson Motorsports. Fittipaldi, who broke both of his legs in a May crash while driving in a World Endurance Championship event, tweeted that he was thankful to walk away from the crash. The race was red flagged, and drivers were allowed out of their cars while the fencing was repaired. Pocono Raceway president Ben May said about 80 feet of fence and a few posts were damaged in the wreck, saying, "It may not be the prettiest job, but it's going to be safe." But Bourdais, who said the repairs were "pretty lousy" raised his concerns about the quality of the repairs and condition of the fence before he got back in the car. It was the second crash of the race, as Rahal wrecked Spencer Pigot while the green flag flew on Lap 1. Rahal was hit with a drive-through penalty on the restart for avoidable contact. Wickens had reeled off five straight top-five finishes entering Pocono and matched a career-best finish of second in the previous race at Mid-Ohio. Chain link fencing acts like a cheese grater when a car gets into it. Oh yeah, we got some window screens and chicken wire! This'll be fixed in a jiffy! I'm glad Wickens is alive and I hope he can return to racing at a competitive level. All tracks need to have fencing and supplies on hand in case of incidents like this....Even more saftey barriers as needed. Has anyone heard any more on Wickens? I heard Thursday that he had surgery to install rods, screws and plates to his spine. He also had injuries to his lower extremities and one of his wrists. I pray to see this young man back up to speed again.